If you are a basketball or a football fan, then this is the first gadget you would want to get. 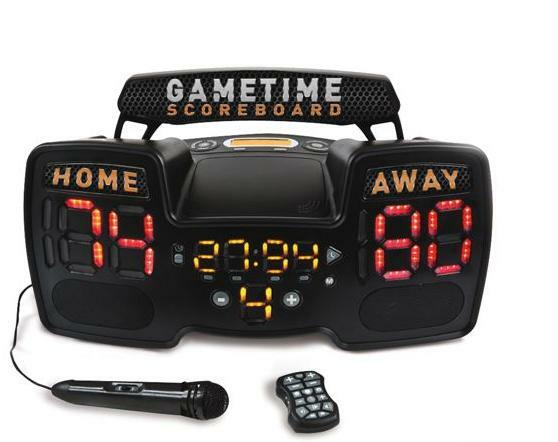 This portable scoreboard lets you contribute play-by-play and add commentary to any football game that is happening in your neighborhood. It was rated as the Top Gadget at the 2010 New York Toy Fair. This thing is capable of amplifying the announcer’s patter with the microphone which comes in the package. It also has built-in sound effects and two 10-watt speakers which can actually create a real game like atmosphere once you start commentating. This is something you would love to have if you love commentating on the backyard basketball or any other sports that takes place. It’s an awesome device and I guess that’s the reason why it won the award. Moreover, the device is capable of displaying the score for the teams 3 inches high which are pretty easy to see even if you are 10 feet away. Also, there is a countdown timer integrated in the device along with a buzzer which makes it capable of adding additional effects in the last few minutes of the game. In addition, you also get 8 different crowd effects such as taunts, cheers, etc. That’s not all, the scoreboard also is capable of playing music if you connect it with your MP3 player or your portable hard drive that has audio content in it. You would want this device especially when the players enter because it can really make those moments memorable. Besides, the device is not difficult to use. It’s pretty easy and comes with simple to use controls on the board. The package comes with an included AC adapter but you can even run the device on eight D batteries which you will have to purchase separately. This device is 12 inches high, 21 inches wide, and has a 9 ½ inches diameter. It weighs around 10 lbs which I guess is not a lot of weight to carry around. It is available for $299.95 so you might want to grab it as soon as possible before the prices go up. Check out some more sports gadgets here: The Retro Flip Down Clock and The Remote Control Fishing Boat.